Trade-A-Boat would like to apologise for the incorrect image that appeared with the Extreme 610 Game King content on page 70 of the June 2012 issue. Here's the picture that should have run along with the overview. 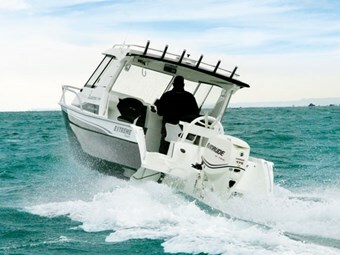 Designed in-house, the Extreme 610 Game King has a long, fine entry and variable deadrise, culminating at 20 degrees at the transom, with a wide, turned-down chine rail that measures 130mm at the transom and narrows to 80mm amidships before tapering off at the stem. The boat imparts a clean, purposeful look, with a deep-vee hull design and a practical hardtop in keeping with its overall dimensions. Painted or Nyalic coated, the 610 looks very much ike the real deal. There are no planing strakes or external keel bar but a self-flooding keel cavity welded to the hull, providing sacrificial protection for beach launching. With a beam of 2.45m, the 610 is notably wider than similar-sized trailer boats, aiding stability at rest. The portofino stern provides walk-through access on the port side. A 25-litre live-bait tank is plumbed in under the step-through, with an option for a saltwater wash-down pump. Handling is admirable, and at about 1600kg on trailer, the 610 bridges the divide between sea-going capability and practicality, providing enough capacity to safely venture beyond sheltered limits. For more information, visit extremeboats.co.nz.